(Nanowerk News) Stephan Link wants to understand how nanomaterials align, and his lab's latest work is a step in the right direction. 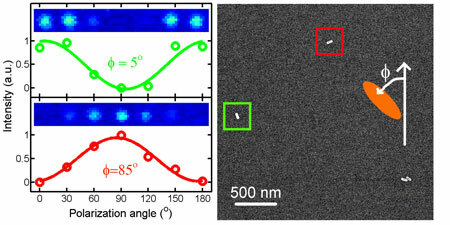 Link's Rice University group has found a way to use gold nanorods as orientation sensors by combining their plasmonic properties with polarization imaging techniques. That may make it possible to see and perhaps track single nanoparticles over long periods. It would give researchers new information about materials, including living systems, that incorporate them. Photothermal technique provides new way to track nanoparticles. "With a spherical particle, you don't have any information about how it's oriented," said Link, an assistant professor of chemistry and electrical and computer engineering at Rice. "We wanted to see if we could determine the orientation of the nanorods, and eventually we'd like to be able to measure the orientation of the environment they're in. We think this technique could be really useful for that." Link, primary author Wei-Shun Chang, a Rice research scientist, and their collaborators reported their results this week in the online edition of the Proceedings of the National Academy of Sciences ("Plasmonic nanorod absorbers as orientation sensors"). Seeing a single nanoparticle is nothing new. A scanning tunneling microscope (STM) can capture images of particles down to a few nanometers; particles tagged with fluorescent molecules can be seen for as long as the fluorophores are active. Link used this latter method to show nanocars rolling at room temperature last year. But there are problems with each of those techniques. STMs see nanotubes or quantum dots just fine as long as they're more or less isolated on a conductive surface. But in the wild, the particles would get lost amid the clutter of everything else the microscope sees. And while fluorophores can help pick particles out of the crowd, they can deteriorate in as little as 30 seconds, which limits their usefulness. Gold nanorods can be "lit up" at will. Lasers at particular wavelengths excite surface plasmons that absorb the energy and emit a heat signature that can be detected by a probe laser. Because plasmons are highly polarized along a nanorod's length, reading the signal while turning the polarization of the laser tells researchers precisely how the rod is oriented. "With plasmonics, you always have two properties: absorption and scattering," Link said. "Depending on the size, one or the other dominates. What's unique is that it's now possible to do both on the same structure or do it individually -- so we can only measure absorption or only measure scattering." Nanorods much smaller than 50 nanometers are not detectable by some scattering methods, Link said, but photothermal detection should work with metallic particles as small as five nanometers; this makes them useful for biological applications. "These gold nanorods are biocompatible. They are not toxic to cells," said Chang, noting their similarity to gold nanoshells currently in human cancer therapy trials based on research by Rice scientists Naomi Halas and Jennifer West. "Our work is more geared to the fundamentals," Link said of the basic nature of his group's research. "Maybe we can optimize the conditions, and then a physician or somebody who's engineering a probe can take it from there. "Our place is a little further down the chain of development. I'm happy with that." Co-authors of the paper are Rice graduate students Ji Won Ha and Liane Slaughter. The Robert A. Welch Foundation and 3M supported the work.